A potential climate study for sugarcane of a sector of Rio Grande do Sul State, Brazil is presented here. GIS technology was applied for evaluation of the risk of frost and for integration of spatial data. The problem was focused in regional scale and in local scale (Municipality of Jaguari). Results showed that cultivation can be programmed in order to obtain physiological maturity before the period of risk of frost, thus avoiding low production. Spatial analysis of the information allows rapid perspective for productivity of sugarcane in a specific territory. The Municipality of Jaguari has large potential for cultivation of sugarcane because of the absence of the risk of frost. Its productivity allows for expansion into suitable neighboring areas. Also, geoprocessing combined with the study of climate and soil appears as a significant tool for interpreting the areas with aptitude for production of sugarcane or for the industry of sugar and alcohol. 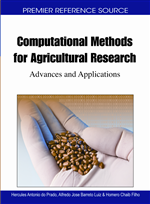 This chapter describes a potential climate study for sugarcane (Sacharun ssp.) using Geographic Information Systems – GIS. This is a representation of the real world using a computer where data are structured according to levels of information (ASSAD; SANO, 1998). Several municipalities of Rio Grande do Sul State were considered, with a specific history case in the Municipality of Jaguari, near the centre of Rio Grande do Sul State which has high production of said crop (Soares, 2008). The state has a significant production of sugarcane, from both a historical and geographic point of view, which could be used in the current context of agro-energy and sustainability. The current expansion of production of sugarcane shows its permanent condition as an element of the social dynamics, due to the requirement of a new energetic matrix in accordance with less harmful practices to the environment and the substitution of fossil fuels. The sugarcane crop runs in tandem with the trend of the international market and the needs of conservation of natural resources, therefore, it constitutes an option for a scenario of more sustainable energy: agro energy. Martin Afonso de Souza cultivated the first plants in Brazilian territory, in the village of São Vicente which was founded by emigrants from Portugal in 1532, a place known as the “Baixada Santista” today, in the State of São Paulo (União de Industrias da Cana de Açucar, 2007). However, the industry was developed in the states of Pernanbuco and Bahia, Northeastern Brazil, due to the tropical climate, the fertility of the soil and the presence of cheap labor (African slaves). The crop was fully oriented towards the production of sugar at first and it was then transformed into one of the most economic cycles in Brazil. After that, sugarcane became a significant crop in the national context, with increasing use in the production of fuel alcohol. As mentioned before, the Northeastern region of Brazil took advantage of the planting of sugarcane and in turn, the crop spread throughout the Southeastern region, assuming a significant role in the national and international scenarios at the beginning of the 21st century. The old National Program for Alcohol was replaced by the National Plan for Agro energy for 2006 – 2011 (Brasil, 2006; 2007). This plan assembles strategic actions in order to reduce consumption of fossil fuels while at the same time, the federal government tries to improve the use of biofuels while conserving the environment, the preservation of the international market and the promotion of social inclusion. The plan foments the agro-ecological zoning for energetic crops in both traditional and new agricultural areas where the expansion of the agricultural frontiers is evident, in this way investment of the private sector is managed. Genetic improvement using traditional methods or biotechnology is also a target because productivity can be improved without a significant advance on unexplored lands. In this way, several states in Brazil have incremented their plantations of sugarcane due to the improvements in the production and installation of plants for the sector of alcohol and sugar. The State of Rio Grande do Sul is inserted in that context when the investments of private and public sectors are oriented to the research of agricultural productivity through vegetal improvement, agronomic efficiency and zoning of climate and soil thereby enlarging the possibility of development of the crop in spite of the risk of frost and low temperatures derived from the subtropical climate. Sugarcane was introduced in the territory of Rio Grande do Sul State in 1725, in the municipalities of Torres, Osório and Santo Antônio da Patrulha, but currently the regions of Missões, Middle and High Uruguai and Central constitute half of the production (Secretaria de Planejamento e Gestão - RS, 2007). Production is important for familiar agriculture from small and medium farms where the crop is used as food for cattle and as raw material for production of candies, brown sugar and spirits. The role of sugarcane as a commodity is increasing and the agro-climatic zonings are the instruments used for the selection of suitable areas for cultivation. The season of planting for Rio Grande do Sul State goes from October to December for the harvest of one year or from January to March for the harvest of one year and a half. The season for growing is October to April and the harvest begins in June or afterwards. Low temperatures (2 – 7 °C) and the short days of winter induce the deactivation of growing; promoting the maturity and the content of sucrose that is regulated until the point of harvest. Temperatures near 17 °C are advantageous for this process that can be disrupted or restricted by temperatures lower than 2.5 °C (Maluf, 2007).